– Arrests of labor leaders and activists continue, with numerous activists being sentenced to long prison terms. Jailed labor leaders and activists include Behnam Ebrahimzadeh, Reza Shahabi, Ebrahim Madadi, and Ayat Niyaafar. – Teacher’s unionists have been targeted for arrest, detention, and torture, including Rasoul Bodaghi and Siavash Eslami. High school teacher Abdolreza Ghanbari has been sentenced to execution. – Workers in several sectors have been denied their wages for months and in some cases years, reducing workers in Iran to slaves and starving workers and their families. – Child labor continues to be rampant in Iran. 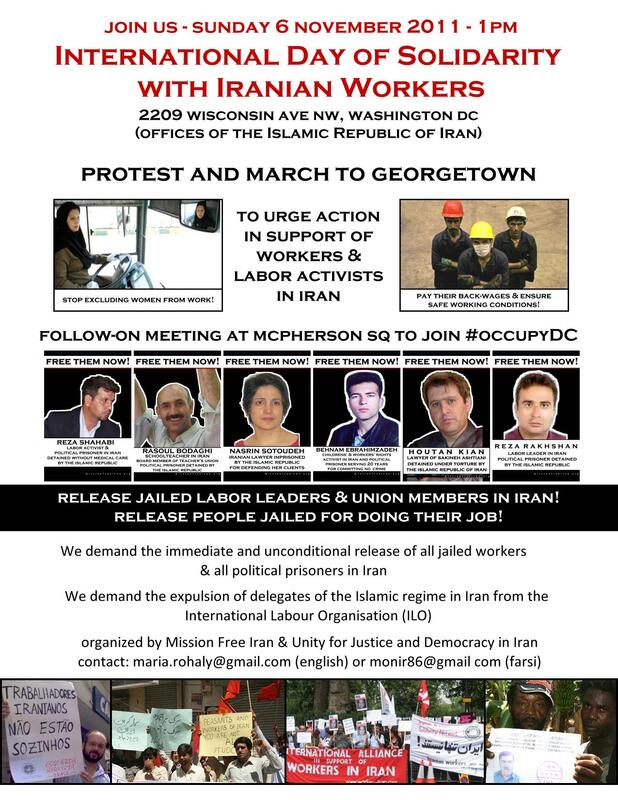 Activists in Washington DC will gather at 1pm in front of the offices of the Islamic Republic of Iran (2209 Wisconsin Ave), followed by a march to Georgetown to distribute flyers to raise awareness for workers in Iran. Activists will then join the #OccupyDC movement in McPherson Square as we raise unified demands for social and economic justice worldwide. The action is organized by Mission Free Iran and Unity for Justice and Democracy in Iran. do not send him to iran.